The IMA’s mission—to train the next generation of researchers and educators—requires mathematicians and scientists skilled at thinking in new ways and across disciplinary boundaries. Thus, it is essential that the IMA engage participants from the largest talent base available, and to strengthen this base. For this reason, the IMA strives to increase the involvement of scientists from traditionally underrepresented groups with IMA programs at all levels—as workshop organizers, participants, and speakers; visiting scientists; and postdoctoral fellows. The IMA’s success in fostering new connections and collaborations gives its outreach efforts particular force. The IMA has partnered with the Association for Women in Mathematics (AWM) for more than 10 years with the goal of both increasing the participation in IMA programs by women and assisting young women mathematicians in their career development. 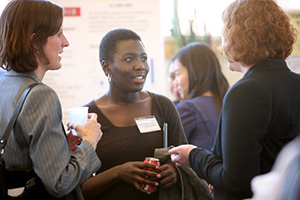 The IMA has hosted several workhops focusing on career options for women in math, including workshops that bring together senior and junior women mathematicians to discuss and conduct research, with the goal of broadening the network that advances women's careers and strengthens their agendas. The IMA Postdoctoral Program has been a driving force for women in the mathematical sciences. Since appointing Amy Novick-Cohen as the first postdoctoral fellow in 1984, the IMA has appointed nearly 70 female postdocs, the majority of whom are now leaders in the mathematical sciences and related fields with clear influence on the scientific landscape. Their continued loyalty to and association with the IMA in turn increases our effectiveness. Leonore Cowen, an IMA postdoc in 1993, was advisor to Christine Cheng, who became an IMA industrial postdoc in 2000. Ruth Williams, an IMA postdoc in 1986, who has had two women among her five Ph.D. students, also served on the IMA Board of Governors from 2003 to 2006. 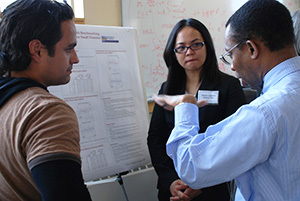 The IMA has hosted several career options for underrepresented groups in mathematical sciences workshops with the goal of encouraging underrepresented minorities at various stages of their careers, including graduate students and postdocs with Ph.D.s in mathematics or math-related fields, to become prepared to work in academia, industry, or government labs. The Modern Math Workshop is held annually in conjunction with the SACNAS conference. The workshop on contemporary research in mathematics is sponsored by all of the U.S.-based mathematics institutes. The topics for this workshop are directly related to programs that are to occur at the sponsoring institutes during the corresponding academic year. All presentations are expository and are intended for mathematical scientists and students who may not necessarily be working in these areas, but who are interested in learning about new developments and the possibility of visiting one of the mathematical institutes. 2011: The IMA hosted 50 middle school girls for a Girls and Mathematics Summer Day Program, which provided fifth, sixth, and seventh graders with a variety of engaging mathematical experiences focused on extending their understanding and knowledge of mathematics. 2012: The IMA collaborated with the Science Museum of Minnesota to produce an exciting installation, featuring activities for kids to explore the infamous Traveling Salesman Problem, where nearly 16,000 museum visitors interacted with the exhibit. 2013: The IMA participated in the University of Minnesota’s Exploring Careers in Engineering and Physical Science program, hosting activities for high-school students over one week in the summer. 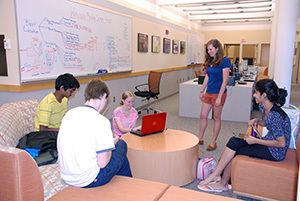 2014: The IMA launched a math modeling camp with the Math Center for Educational Programs (MathCEP) to offer high school students the opportunity to work in teams on a real-world problem under the guidance of a mentor. This program is still ongoing; please visit the Special Workshops webpage for the most recent camp year. The IMA has also previously participated in University of Minnesota outreach events and programs, like the Minnesota State Fair and the CSE Math & Science Family Fun Fair.